I shared my kids birth stories on the blog back in 2012 (here and here), but I've never shared my emotions about those experiences. When Marley was born in 2008, I was 23 years old, the first one of my friends to be pregnant, and not very informed on the whole child birth process. I read a few books and did some online research and was fine with what I knew. I didn't have a plan besides to have my baby and if I needed pain meds that was fine with me. She was born and everything went well and I was happy. I poorly tried to breastfeed for a few months but stopped because we were going on vacation when she was 3 months old and again, I was happy with that decision. I have no regrets about how anything went then or now. Fast forward to 2011 when I got pregnant with Mason. 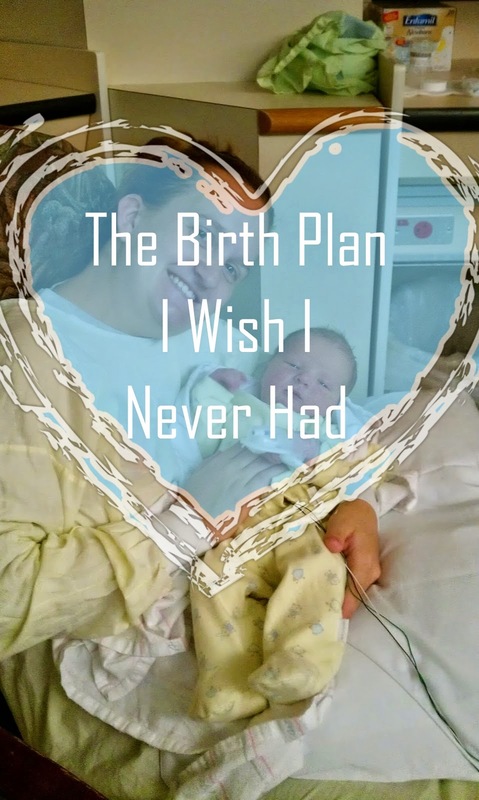 I knew he would probably be my last baby so I wanted to have a plan on what I wanted to happen in delivery and with breastfeeding. I read tons of books, tons of online articles, and I even created a breastfeeding group on Facebook. I had it in my head that I would hold off on pain meds for as long as possible since I now knew what the pain felt like and I would try to manage it better. I also visioned him being born, laid on my chest and being so in love. I wanted to breastfeed him for at least a year, if not more. I knew what I wanted and had my perfect labor experience all planned out in my head. Then the day came, April 5th, 2012. I was 41 weeks pregnant and being induced. I was okay with being induced, I was with Marley and had no problem with it. I labored for about 10 hours before the doctor said the words no mom really wants to hear "you need a c-section" I was crushed. This wasn't part of my plan. Mason was born just a few minutes after they wheeled me into the OR. They cleaned him up, brought him over for me to see and then took him and Mike to the nursery while I was stitched back up and taken to recovery. I was there for a few hours before they brought Mason in. When the nurse brought him in she also said something else that no mom wants to hear "he needs to go to the NICU for low blood sugar" This was horrible and again not part of my plan. I was taken to my room a few hours later, Mike went home, and Mason was in the NICU. I was all alone. I was in the hospital for a few days and was able to go down and see Mason, but wasn't allowed to hold him as much as I would of liked since he was hooked up to monitors and I was in some pain from the c-section. I was discharged from the hospital, but Mason had to stay. It was awful. Luckily, we went home and dropped Marley off at her grandpas and then headed back up to the hospital to be with Mason so that was good that I was able to still go up there and see him. He was in the NICU for a whole week. Since I had wanted to nurse, but was unable to, I started pumping. They did bottle feed him in the NICU but also gave him formula too to help raise his blood sugar levels. Once he came home, since I hadn't ever nursed him I continued to pump for 3 months all while also trying to get him to latch. I'll never forget the day when he actually latched and had his first real nursing session. I loved every minute of it. I slowly quit pumping and nursing him more. When he was six months old he still wasn't on the growth chart and nursing was becoming painful. I had over 800 ounces of milk in the freezer that I started giving him and I decided I would nurse him, then offer a bottle. Once all the milk in the freezer was gone I would stop nursing him and start him on formula. Remember my plan to nurse for a year or more? Yah, that didn't happen. At that time, I was okay with everything that had happened and was just happy to have a healthy growing baby boy. Fast forward again to October 2013, Mason is now 18 months old. For some reason it's taken 18 months for me to come to terms with what happened and how unhappy I am about it all. I am in tears every time I think about it or talk about it. I can't help but feel like I failed. I couldn't birth my child and I couldn't nurse him either. I talk with Mike about it, but he doesn't understand and says as long as Mason is healthy why does it matter how he got here, or what he ate. Don't get me wrong, I am SO happy that he is healthy and growing and I know it definitely could of been much worse, but that doesn't help me deal with the sadness I am feeling about what happened back in April of 2012. Just last week (Mason is now 26 months old) I think I realized why I was so upset about everything. It's because of that darn plan I had. A friend of ours had a baby and had a scheduled c-section because her baby was breech. Mike had mentioned that she was happy and excited about having her baby and wasn't upset about the c-section as long as her baby was healthy. That was my epiphany moment. I had this big plan to deliver him a certain way, to feed him a certain way, and had all the other little moments planned out. I never once really thought, I just want a healthy happy baby because that's just a given, who doesn't want that. I didn't have that as part of my plan like I did when I delivered Marley. I was too worried about everything else being perfectly planned out. Looking back now, I wish I didn't have a plan, I wish I would of gone into it thinking I just want to have a baby. How happy would I of been then, cause that's the only thing that would of gone according to my plan.